Mangaluru, Jan 27, 2018: Mystery has shrouded the death of Rachana, a second PUC student at Alva’s College Moodbidri, after her parents who are from Chitradurga alleged that the handwriting in the death note which Rachana is said to have left behind, was not that of their daughter. It was earlier stated that Rachana had jumped off the fifth floor of the College building on January 25 Thursday. The death note left behind her states that her health problems as well as the low marks scored by her had forced her to take the extreme step of suicide. 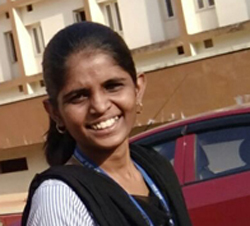 Her father Manjunath has lodged a complaint with the Moodbidri Police and have accused the management of the college of negligence that led to his daughter’s death. The death note which Rachana had reportedly written will be sent to graphologist for analysis. Rachana’s mother has said that if she had really jumped off the building there should have been serious wounds on her body, but there were no such wounds. Moodbidri Police are investigating the case.